On August 26, 2014 HP announced a worldwide voluntary recall and replacement program in cooperation with various government regulatory agencies, for affected AC power cords distributed worldwide with HP and Compaq notebook and mini notebook computers (including mobile thin clients and mobile workstations), as well as with AC adapters provided with accessories such as docking stations, sold from September 2010 through June 2012. Let's get started: Unplug your power cord from the wall outlet. Potentially affected power cords can be identified by a molded mark on the adapter end of the power cord. The molded mark will be “LS-15”. 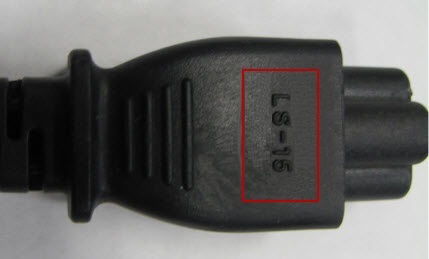 Not all power cords with the “LS-15” molded mark are affected. How do I find the date code? Locate your notebook product name and serial number. This information can be obtained by holding down the [fn] key and hitting the [esc] key. The information on your screen will display this information. If [fn] + [esc] does not show you your system information, please check the product label on the bottom of your unit. This label may be in the battery compartment.